Tuesday, August 8, 1911: Went over to see Carrie on an errand, but came back in about fifteen minutes as I had a rebellious heifer to keep out of the orchard. 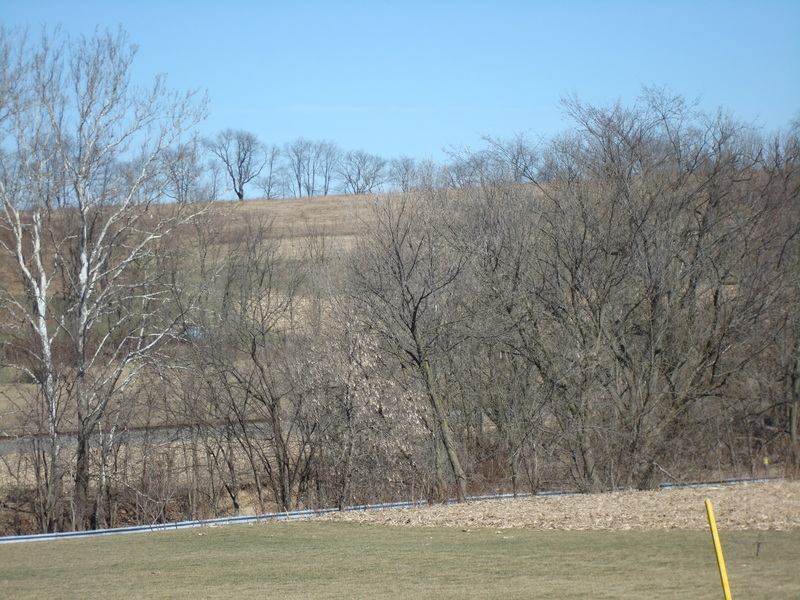 Recent distant view of the Muffly fields from the road near her friend Carrie Stout's home. (I wonder where the orchard once was.) Today it would be impossible to see the Muffly fields once the leaves are on the trees--but maybe it was more open back then. I continue to think that the family would have used barbed wire to fence the pasture but maybe they didn’t. And, even if there were fences maybe the cows were able to escape (cows can be very adept at finding holes in fences). Yes, it sure was always an exciting time. I might also use terms like frustrating and vexatious. When I was child, when the cows got into the corn or the wheat we worried so much about the damage that was being done to the crop. I love the way you make a comment after what your Grandmother said in her diary…I am transcribing my mother’s diary from when she was 15…I think that maybe at a later date, I will do the same thing and respond on one of my other blogs. Thank you for sharing. It is wonderful!!! Thanks for stopping by. It’s wonderful that you’re transcribing the diary. If you decide to post it, I’d love to read it. It ‘s so much fun reading about the day-to-day events years ago.